Overlay Extension - Let your viewers DJ your Music! 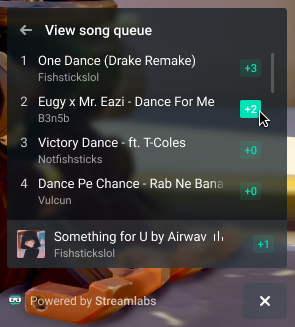 Letting your viewers control what songs play next is a great way to keep them around longer. We’ve integrated with Soundcloud to bring you their library that is available through their API to third-parties. Viewers can search for a song through the menu. Songs get added to a queue. Once a song finishes, the next one that is queued up by viewers will play. Recent Events must be open for the music player to work, either on our website, via Streamlabels or within Streamlabs OBS. As the broadcaster, you get player controls to auto-play, shuffle, volume, skip, and re-arrange / remove songs from the queue as you see fit. Look for the new Music Tab in recent events.